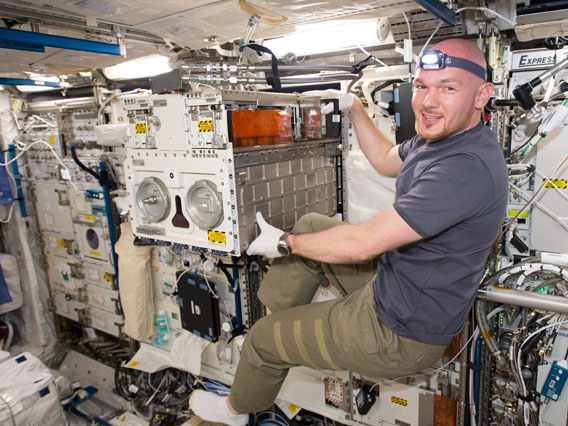 ESA astronaut Alexander Gerst works in the Columbus lab preparing the Biolab for future experiment work. ESA astronaut Alexander Gerst scanned his arteries then measured his body shape and size Wednesday. Flight Engineer Barry Wilmore joined Gerst for the scanning activities using an Ultrasound for the Cardio Ox experiment. NASA astronaut Reid Wiseman assisted Gerst with the Body Measures study. Wiseman also scanned Wilmore’s retinas for the Ocular Health study. Gerst continued more work on the Aquatic Habitat in Japan’s Kibo lab module for the Zebrafish Muscle experiment. In the Russian segment of the orbital laboratory, Commander Max Suraev continued packing gear inside the Soyuz TMA-13M spacecraft that he, Wiseman and Gerst will use to return to Earth on Nov. 9. Cosmonaut Alexander Samokutyaev assisted Suraev’s departure effort, checking the Iridium phones used in the Soyuz for emergency communications. Elena Serova participated in a psychophysiological evaluation, then inventoried gear in the Zarya module and Pirs docking compartment. The next trio to launch to the station is getting ready for a news conference to be held Thursday in Star City, Russia, before going to Moscow for traditional pre-launch ceremonies. Expedition 42/43 crew members Terry Virts, Samantha Cristoforetti and Anton Shkaplerov are due to liftoff Nov. 23 aboard their Soyuz TMA-15M spacecraft for a six hour ride to their new home in space.